When traveling with babies one of your biggest concerns may be where they will sleep. Yes, you could rely on cribs being provided at accommodations, but imagine the stress if they aren’t. Even after meticulously checking several times, oversights happen. So why not take the stress out of where your precious baby will sleep by taking your own travel crib with you. Traveling with your own crib provides your baby with a familiar sleeping environment, making a good night’s sleep more likely, and it also provides higher standards of comfort for your child. Not to mention, when you use your own carefully selected product, you know it is safe and secure and perfect for your baby. The best travel cribs are also easy to transport and use. 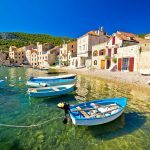 So, what is the best travel cot? What should I considering when buying the best travel crib? To help answer these questions, we’ve done tons of research to give you the best of the best. Overall, the BABYBJÖRN Travel Crib Light is ultimately the best portable crib for travel. 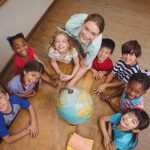 However, everyone has different travel needs and preferences, so check out our other reviews at the end of the article to help make the best decision for you and your family. 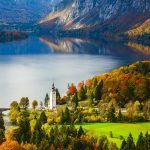 Below are the best travel cribs available. Click on the stroller name to read reviews and check prices. Here are some of the key things to think about when buying a travel crib. The safety of your child is obviously the most important thing to consider when buying any baby-related product. All of our recommended travel cribs comply with safety standards. However, some travel cots have additional features that make them a little more secure than others. Look at how easy it is for your child to crawl out of the crib; if they can easily escape then it’s not the best crib for you. Check also whether little ones could fall out of gaps in a cot. Is the crib sturdy, or could your child knock it over when moving around? 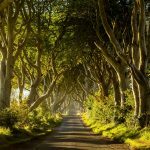 Some travel cribs may not be so sturdy alone, but come with points where you can tie them down for added security. Some other things to think about are the amount of space between the sides, mattress ventilation, and how fitted the sheets will be around the mattress. Comfort is another huge factor when buying a travel crib. After all, a good night’s sleep for your baby usually means a good night’s sleep for you too! Check the paddedness and softness of the mattress, space availability, as well as the air flow. Things like canopies and toy rails might add to the comfort and pleasure, but may not be necessary; consider whether extra features do actually enhance your child’s comfort level or whether they just add extra weight. While many travel cribs are suitable for babies of various ages and sizes, there are also those that are more suited to either infants or toddlers. Look at the maximum weight limit and the crib’s size to make sure it’s suitable for your child. If you’re buying for a newborn but plan to travel a lot in the future, choosing a travel crib that is suitable for a wide age range is recommended; you don’t want something that your baby will quickly outgrow. Keep in mind that toddlers are much more likely to get out of cribs than tiny babies, so you’ll want to also buy a travel cot that is not only safe now but will continue to be safe as your child develops. Other than comfort for their child, one of the main things people look for in a travel crib is the ease of transporting them; any item that is similar to your day-to-day cot at home isn’t really worth the expense! Consider how easy it is to carry the travel crib; the best travel cribs are lightweight and compact to a small size, yet open up to be big enough to comfortably accommodate your child. 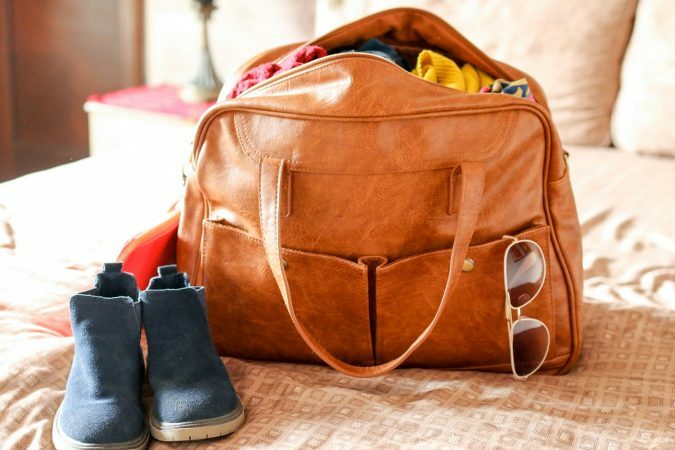 Some travel cribs have extra accessories like wheels or a carry bag. 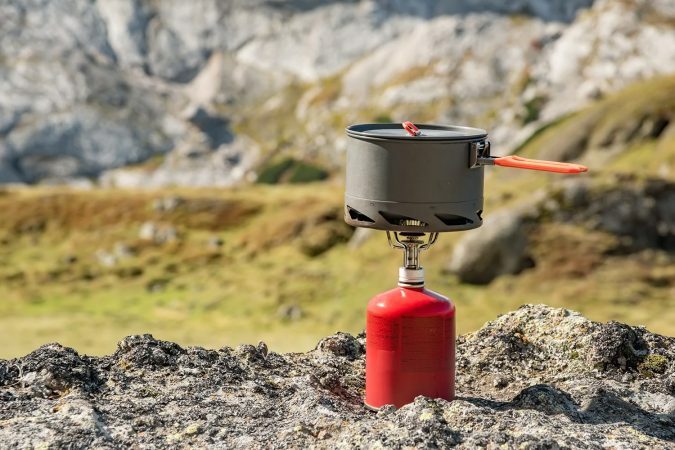 Decide what additional features are most important to you, keeping in mind they may increase the size and weight while decreasing the ease of portability. Think about how easy the cribs are to assemble and re-pack. If you’re staying put in one place for a longer period of time you may be happy with a crib that takes a little more effort to set up. If you’ll be moving around a lot, quick and convenient processes will be more important. There are two main types of travel cribs: cocoon-like beds and those that unfold to look more like a regular crib. There are pros and cons of each. 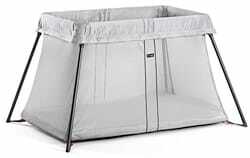 The cocoon-style cribs are generally lighter, more compact, and easier to set up. They do not, however, provide space to stand or play, and they are generally also easier for older babies to get out of. The second variety is typically more secure and provides more space; many are suitable for daytime use as a play area too. The downside is that they are often heavier and bulkier. Of course, the cost is also something to think about when buying a travel crib. 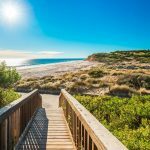 The best travel cribs should last for a substantial period of time, thus making them a great investment for parents who frequently travel with the kids. 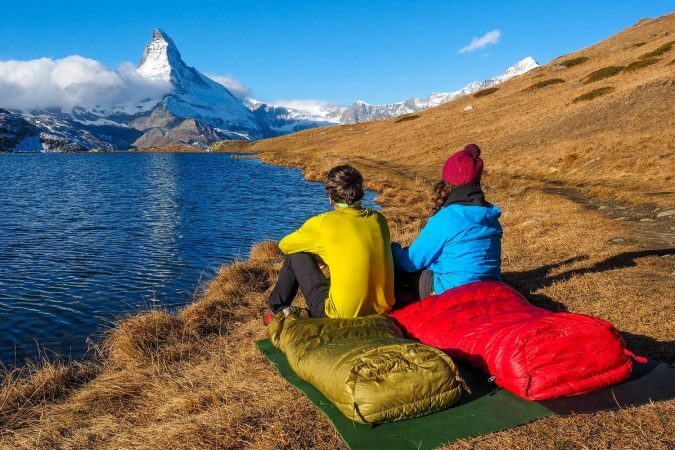 After hours of research, these are our choices for the best lightweight travel cribs. Coming out on top, the Baby Bjorn Travel Crib Light is the overall best baby travel crib. The excellent design means the crib is durable and comfortable, and it includes an insulated mattress. Weighing just 13 lbs, it’s also lightweight. With no loose parts to attach and the legs unfolding automatically, the crib is super easy to put together, disassemble, and maintain. The base is sturdy, creating a safer place for your baby to sleep while giving you a greater peace of mind. You can check in on your little one at any time thanks to the see-through mesh sides. As well as being one of the most comfortable travel cribs on the market, it also has plenty of space for your child to rest and play. You really can’t beat the Baby Bjorn Travel Crib Light when it comes to the best portable crib for travel. The Lotus Travel Crib and Portable Baby Playard provides not only a comfortable and safe sleeping environment for your baby, but it’s also one of the best travel play yard and cot combinations available. It is suitable for newborn babies right up until they no longer need a crib, making it one of the best travel cribs for 1-year-olds as well. The mesh sides provide visibility and safety, while the mattress and included fitted sheets add to the comfort. The “side door” can be zipped open and closed, so your baby can be zipped up safely when they need to be or you can unzip it so they’re free to roam. The Lotus Travel Crib and Portable Baby Playard is perfect for parents on the go, as it quickly and easily folds up and down in just 15 seconds. At 13 lbs it is lightweight, compact when folded, and is small enough to fit in the overhead lockers of many airplanes. Not only that, but it comes with a backpack, so no matter where you’re headed it’s easy to take your Lotus Travel Crib and Portable Baby Playard with you. 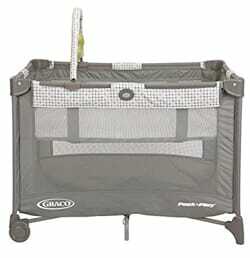 The Graco Pack ‘n Play On The Go Playard is one of the best travel cots for newborns. The full-size removable bassinet is suitable for babies weighing up to 15 lbs and provides a comfortable sleep any place, any time. The spacious playard keeps your child safe and the mesh sides provide ventilation and visibility. There’s even an included toy bar with soft toys for your child’s amusement. The frame is more than durable enough to cope with the stresses and strains of travel. It folds compactly, with the feet and wheels folding inward to make it more streamlined. The included carry bag makes it easy to transport and it is fairly lightweight, weighing just 23 lbs. Make sure your child is comfortable and entertained no matter where you go with the Graco Pack ‘n Play On The Go Playard. 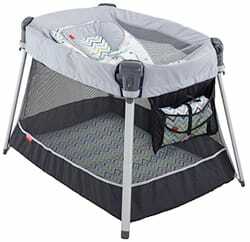 The Fisher Price Ultra-Lite Day and Night Play Yard is a fantastic multi-use product for traveling parents. Combining a comfortable place to sleep, a secure play area, and a handy changing station, it’s among the best travel cribs for newborn babies. There’s even a convenient storage pocket on the outside, great for keeping wipes and diapers on hand. The inclined sleeper can be removed and it has a three-point restraint, cushioned head support, and other features to ensure your baby is comfortable and safe. It’s also easy to put up and fold down and weighs just 15 lbs. The Fisher Price Ultra-Lite Day and Night Play Yard really has everything your baby needs for sleeping, playing, diaper changing, and more. A huge plus point for the Graco Travel Lite Crib with Stages is the fact that it can be adjusted as your child grows. You can use it for your newborn, and then alter the height of the bassinet as your baby gets bigger. In our eyes, this makes it the best travel bassinet, as it’s designed to be suitable for a fairly long time. 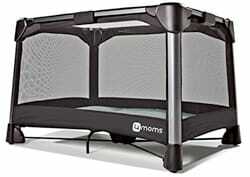 The roomy play yard also makes it a great place to keep your baby safe when they’re awake. 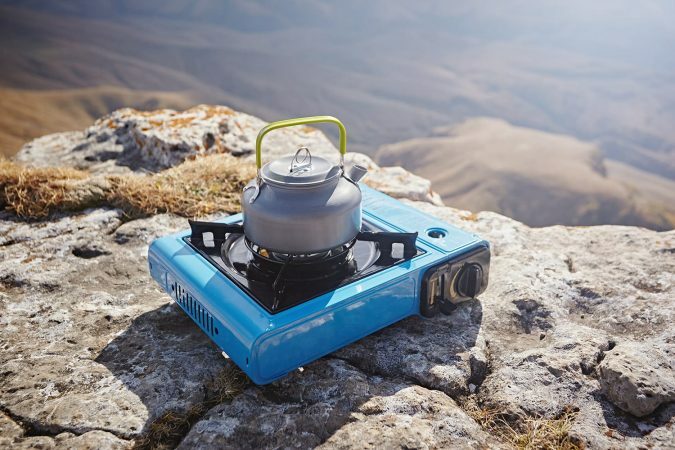 The space-saving design, lightweight nature (it weighs 20 lbs), and small wheels make it very portable. Don’t let the size and weight fool you, it’s still big on features. Boasting a comfortable padded mattress, a canopy, and a toy bar, the Graco Travel Lite Crib with Stages guarantees a happy baby and happy parents. The 4moms Breeze Playard wins hands down when it comes to ease of use; all it needs is one push to open and close. For convenience, this is among the best travel cribs. The full-size playard also comes with a removable bassinet, providing a great play area by day and a comfy sleeping area by night. It is sturdy and durable, great for active travelers who spend a lot of time on the road. It compacts down into an easy-to-carry bag, complete with a shoulder strap. Weighing almost 25 lbs, it might not be the lightest travel crib available, but it is certainly one of the most convenient to use. The pop-up, cocoon-style KidCo PeaPod Plus Infant Travel Bed is one of the best travel cribs for infants. It weighs just 3.5 lbs and folds up super small into the included bag. 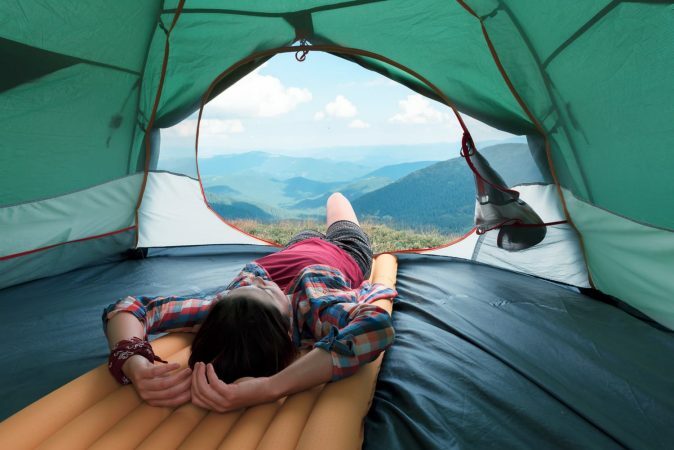 It is effortless to use, fully assembled, and very travel-friendly. 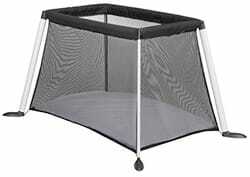 You can anchor it to the ground or to a bed for greater stability and security, and the mesh sides aid ventilation. While there’s no space for an older kid to stand up, it’s a cozy sleeping environment for a newborn. Whether you’re going camping or to the beach, the KidCo PeaPod Plus Infant Travel Bed is perfect for all of your outdoor adventures. The BRICA Fold N’ Go Travel Bassinet is a top choice if you just need somewhere safe, secure, sturdy, and comfortable for your baby to sleep. Among the best travel cots for newborns, features include a lockable frame and breathable mesh panels. Along with being quick and easy to set up, it’s one of the smallest travel cribs available and folds down small enough to fit inside your suitcase. Weighing less than 3 lbs, it’s easy to carry alone or pop into your carry-on luggage. The BRICA Fold N’ Go Travel Bassinet gives you the peace of mind that your baby can sleep comfortably and safely no matter where you are in the world. 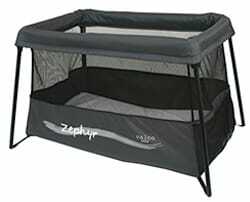 The Valco Baby Zephyr Travel Crib is one of the most comfortable travel cots for your child, with a padded mattress and an insect net. You can see through the mesh sides and there are small pockets where you can easily keep the essentials. It comes with a travel bag and is easy to set up and break down. While it doesn’t provide much space for daytime use or play, it is spacious enough for a cosy sleep. The frame is sturdy, but it manages to be pretty lightweight, weighing just 14 lbs. The Valco Baby Zephyr Travel Crib will be your baby’s favorite home away from home. 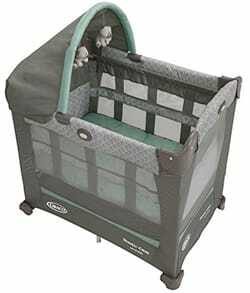 Phil & Teds Portable Traveller Crib is among the best lightweight travel cribs, weighing a mere 7 lbs. It’s really easy to transport and carry, folding down to a compact size and coming with a carry bag. Its convenient carrying bag makes it ideal for families who frequently travel on airplanes.. It has lots of space for your baby to sleep and be active, making it one of the best travel cribs for toddlers, and the inflatable mattress even comes with a sheet for extra comfort. The sides and top are made from see-through mesh, and one side can be fully unzipped. The UV top provides sun protection during every type of outdoor activity from picnics to sporting events. Overall, combining the levels of comfort, portability, compact nature, weight, and space, this is the best portable crib. 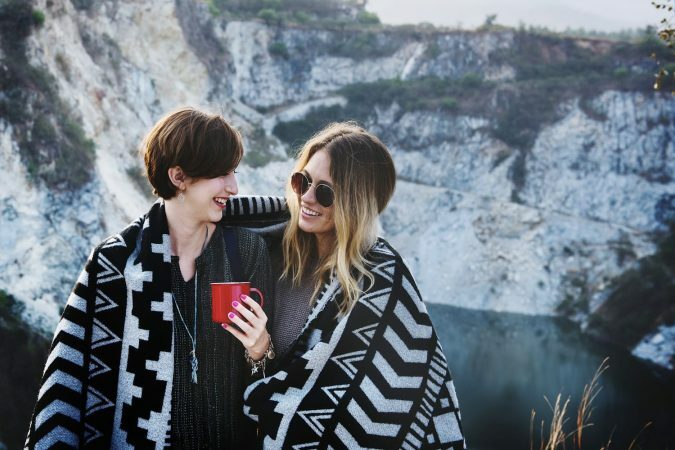 From planning a vacation or a trip to visit family to going for days out or meeting friends for coffee, these best travel cribs add peace of mind and convenience to countless situations. With products suitable for newborn babies up to toddlers, you’re sure to find the best portable crib to meet your needs and requirements.